Throughout Fall, I love making homemade applesauce and recipes that include Pumpkin. I'm a huge fan of Pumpkin Spice Latte's! Confession time...while my husband and I were away over the weekend, I drank one! It tasted great but didn't exactly agree with me shortly after drinking it. It was definitely not the best choice I could have made. Today I tried something new. I found a Pumpkin Pie Shakeology Recipe. I've been wanting to try it for several days and finally got out to the grocery store to get what I needed. I made and drank it for lunch today and it was DELICIOUS! I added a little extra cinnamon once I poured it in my glass and it was the perfect touch! 1. My drink was a complete meal, packed with over 70 super foods. 2. I got all of the vitamins and minerals that I need for the day. 3. Because of its sweetness, it helped curb my cravings for unhealthy, high sugar foods. 4. It was full of antioxidants. 5. My drink was equivalent to eating 6 salads in one meal! 6. It kept me full for about 3 hours until my next meal because it had the correct carb to protein ratio. 7. It was convenient! It took me about 2 or 3 minutes to fully make (including clean up). With two toddlers running around, something quick and easy is always a plus in my books! 1. I wasted $4.50 for instant gratification. 2. It kept me warm on a cool night. 3. I drank A LOT of calories. 4. It kept me full for...umm....actually, it kept me full for the rest of the night because my stomach hurt! 5. Although it may have been a quick and convenient purchase, it certainly was not a meal, nor would it even come close to it. 6. I got zero nutritional value. Drinking Shakeology has really made a difference in my life. It has helped me lose weight, gain energy, and fight those bad cravings, to name a few. For me, it has been totally worth every cent. My only regret is creating those excuses that prevented me from trying it sooner. This is a drink that can truly help your health, no matter what age. If you are interested in trying Shakeology, please contact me! I sell $5 samples if you'd like to try it before you commit. I am also running a Shakeology and Fitness Challenge group beginning September 23, 2013. Within the group, you will not only learn how to incorporate Shakeology into your day, but you will also be provided with nutritional tips and information to help you make healthier choices and turn your life around for the better! 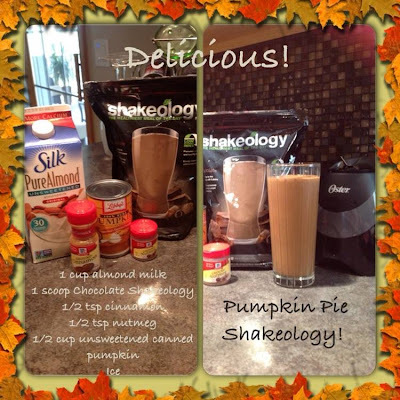 For anyone who is already drinking Shakeology, enjoy the recipe!